The most awaited festival across the globe is near. Yes, we are talking about Christmas and New year. It’s a time to plan holidays and parties with friends and family. Parties and holidays means clicking and preserving precious moments in the form of pictures. While smartphones nowadays have ample storage, they still tend to run out of space making it troublesome capturing pictures. 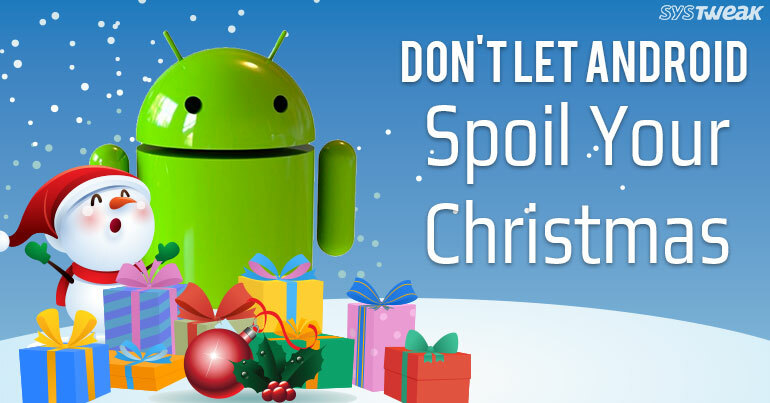 Here in this article we are going to jot down some of the easiest and effective ways to make sure you never run out of storage space on your Android device this Christmas and New Year. Got a warning message of device storage full? Well this may astonish you for a moment but over time pictures tend to clog your storage space. Many a times we tend to click ample pictures at the same time to get the best shot possible. However, to get a perfect shot, we don’t realize that these pictures occupy precious storage space on your smartphone. You may think that cleaning these innumerable duplicate photos manually would help, but honestly this is an impossible task to accomplish. Another easy option is using duplicate cleaning apps easily available in market. An easy to use and effective duplicate photo Cleaner is Duplicate Photos Fixer from Systweak Software. As the name implies Duplicate Photos Fixer is the one stop solution to get rid of all the duplicate pictures that eats up precious storage space on your Android device. Using this amazing app, you can scan your entire device, specify a location or even scan the camera roll as per your needs. Duplicate Photos Fixer shows you the scan results in categories that makes it easy for the user to review the duplicate photos. This ensures you clean only the duplicate photos retaining the best one. Last but not the least, it also lets you set preferences for more accurate results. Try out this amazingly effective app today. Download it from Google Play Store. Just as duplicate pictures waste precious storage space, so do duplicate files. Most of us download flies and other data without seeing their usefulness in long run. It’s not that these files are unimportant and you should not download them. The major drawback is that these files, songs, movies etc. make your Android device run out of storage space and just like pictures it is not possible to delete them manually. Now when Christmas and New Year are near, you are not looking for a device that cannot let you capture precious moments in form of pictures and videos. So, to avoid your Android device running out of storage space, here we present to you the best duplicate file cleaner app in market. It is available for Android, Mac and Windows users and is the most trusted app when it comes to remove duplicate files. It has a clear and crisp user interface that makes it easy to scan and clean the files. Easily scan, auto mark and delete duplicate files in a jiffy. Duplicate Files Fixer shows a preview of files to ensure only the duplicate file gets deleted. It also lets user select their own search criteria to scan based on file types, location and find duplicates from Android device. Though deleting duplicate data is an effective solution for your clogged smartphone. However, some people may not want to delete anything from their PC. Owing to this, they must look for alternatives to manage their Android’s storage space. One of the most used and effective solution to this is using an online backup tool to backup all your data on cloud. Online cloud storage apps not only provide an effective solution to store your data, they are also secure and reliable. Not only this, they can be accessed from anywhere anytime. An easy to use, effective and secure cloud storage service that lets you backup your data anywhere anytime. Simply download Right Backup Anywhere on your Android device and sign in and it will manage all your backup. It automatically takes a backup of your precious data and keep it safe and secure from any attack or sudden breakdown of Android devices. Not only this, you can also share your pictures and videos with your friends. Irrespective of the amazing and high-end specs smartphones get sluggish and over cluttered with unwanted files, folders, images, videos, cache, installed apps etc. There are many optimization tools available nowadays which when effectively used make your smartphones work seamlessly. One such tool from Systweak Software is Systweak Android Cleaner. It is a one stop solution to your slow performing Android device. It helps boost your device performance by cleaning the cache. The 1-Tap Booster feature effectively closes all the apps and services running in the background. Easily optimizes your Android device by removing junk. Systweak Android Cleaner also comes with a Duplicate Files and File Explorer feature that effectively removes duplicate and redundant flies and pictures hence recover storage space. It also comes with a battery saver feature to effectively save battery drainage. Try out this amazingly effective android cleaner app today. Download it from Google Play Store. Apart from these easy to use apps that effectively manage the storage space on your Android smartphones, you can also think of adding up your storage space by using external SD cards. SD cards provides an effective solution to enhance your storage space and makes sure you never run out of storage space on your Android device. However, if your smartphone does not support extending the storage, you can use External Hard Drive that can easily be connected to your phone to transfer photos and other data. So guys, these were some options that you can use to make sure you never run out of storage space on your Android Device this Christmas and New Year. Try out these amazing apps and ideas and never lose a chance to capture moments.